Yes, I've seen both in the metal. As for what I've heard and know about the watches, I posted that way back on page 1 I believe. As for what I haven't heard, think about your question! If I haven't heard it, how would I know to talk about it. So, be smart, read all the comments, read my knowledge of the 2 versions above, and THEN tell me something I don't know or haven't heard yet before ranting? Now, continuing on with the insanity, for those of you who own the Hesalite version, how easy is it to scratch the crystal? if you decide to get the hesalite version buy a tube of polywatch on amazon. works wonders on hazy, scratched, tired hesalite..
Just ignore the rant! The hesalite can be easily scratch but very easy to take them out with polywatch or other similar products. 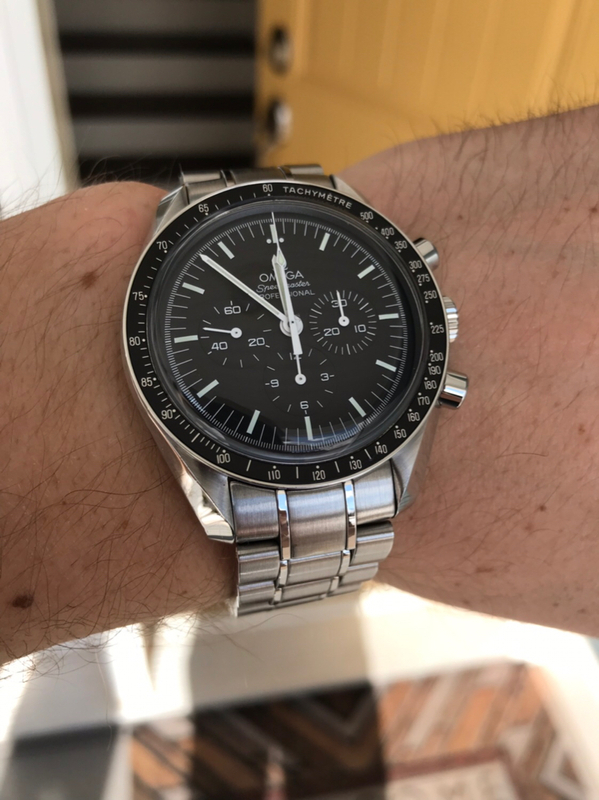 My Speedmaster is not a daily watch and to be honest don't worry too much about the scratches on mine; just wipe them out every now and then. I would like to add my voice to the sapphire sandwich side. I've seen both, and the difference in terms of looks isn't that far for me. The hesalite has the vintage-vibe "warm" look, and the sapphire has the quirky "milky ring". Both crystals are able to show the dial clearly. But the 1863 movement is what decided for me. The finishing is better than the 1861, and it's almost on a level that you see on high-end watches. I've read that the plastic vs metal delrin brake doesn't really affect functionality much, main reason is asthetics. And since I'm lazy, I pick the sapphire so I don't have to polish it. I also tend to put my watch in my pocket when there's a high chance that I'll bump it around. It's called "taking good care of your stuff." In 2013, I got into watches and wasn't long before I discovered the speedy for myself and it became a grail for me. I had the same predicament as you. After reading a lot of heasalite vs sapphire, I couldn't ignore the sapphire crystal's scratch resistance but more importantly, I wanted that display back. I had decided I will be getting the sapphire sandwich. Pining for the speedy sapphire for 4 years. Fast forward 2017, I went to the Omega boutique and asked them to get me the speedy sapphire. This was my first ever visit to any boutique or high end (to me) watch shop so I wanted to see some other models. I looked at a few seamasters and was looking at the hesalite version while they bought me a sapphire version form the back. They bought it out to me on a jeweller's tray and heartbreak...That milky ring was so evident in person and it looked ghastly to me...I turned it over and it was beautiful with the movement on display and then I looked at the hesalite and just knew it was hesalite for me. The sapphire a certain clarity that hesalite can't match but it destroys the design for me with the ring of white....it's almost as it has a secondary internal bezel. 2 years on, I don't regret my decision one bit. Although it would ve been nice to have a display back, I know i can always buy a aftermarket display back to see the movement. As for scratches. I think i wear my watches enthusiastically and my speedy was scratch free for around 18 months...then when it did appear, a bit of polywatch, 2 mins and it was gone. Perfect. Polishing the crystal only once in 2 years isn't bad. That's just my story...go to the store and see for yourself...If you can live with the aesthetics of the sapphire crystal and the way the dial looks with it then by all means why even bother with hesalite? Otherwise stick to hesalite. It has a certain 'je ne sais quoi' to it. fskywalker, rfortson, jaymd and 1 others like this. Please don't let my experience deter you from buying the watch. Mine is surely unique, and I have no doubts I'm at fault. The scratches are more of a haze anyway, and as I said, only visible at specific angles with the sun hitting it just right. I just tried to capture it with my phone and I can't. Additionally, the shirt I used wasn't just plain cotton. It was a moisture wicking tech shirt I got from a marathon I ran last year. It's possible the material was more coarse than a normal t-shirt. When I say I'd buy sapphire if I could do this over again, keep in mind I've never seen the two models side by side. My knowledge of the milky ring is only what I've seen in pictures. So maybe I'd still choose hesalite after doing a comparison of the two. Regardless, this is a fantastic watch and I'm sure you'll love it as much as the rest of us do. Besides, a few dings here and there add character. Well, I just saw some high quality side view pix of the 2 watches. I gotta say, the Sapphire version from the side is, how shall I put it, ungainly. It just looks wrong to my eyes with that vertical wall rising so high above the bezel. Plus, that milky ring from the front view will be like a magnet to my eyes. All you Sapphire owners, please don't be offended. One man's jewel is another man's lump of coal. thus reducing the chance of bumping it. Neuromancer, Carl.1, fskywalker and 3 others like this.